Saturday, 11:00 pm: I just put a pan of brownies in the oven after an 8-hour shift at work, a reviving 2 1/2 hour nap, a peanut butter & jelly sandwich for dinner, and an hour's worth of recreational reading. Yep, that's how exciting my Saturday nights are. And, you know what? I'm okay with that. Really, I am. I have, in the past year and a half, learned to appreciate my alone time...even the stillness of a quiet house. I've also learned that time is relative...and that there's nothing wrong with baking close to midnight. It's okay, too, to eat dinner at 9:30...whether it's PB&J or chicken tagine that took a couple hours to make. 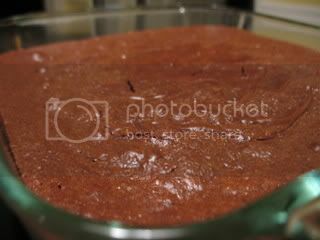 I was happy to see that this week's Tuesdays with Dorie recipe was one for brownies, because brownies--homemade, not from a boxed mix brownies--are on my list of "things I've never made before." This recipe, chosen by Di of Di's Kitchen Notebook, was originally intended by Dorie Greenspan as a chocolate cake with rum-soaked raisins. I left out the fruit, as I am a brownie purist. The result was a thick, chewy, fudgy brownie that is so good that I made two batches! The first batch was gobbled up at a cookout on Sunday (seriously, they were gone before I could even get a picture!). The second batch, which I baked last night, was eaten warm with homemade vanilla ice cream & raspberry sauce. This recipe is exactly what I look for in a brownie. From now on, it's my "go to" brownie!! Working with a stand mixer with the whisk attachment, or with a hand mixer in a large bowl, beat the eggs and sugar until they are thick and pale, about 2 minutes. Lower the mixer speed and pour in the chocolate-butter, mixing only until it is incorporated—you'll have a thick, creamy batter. Add the dry ingredients and mix at low speed for about 30 seconds—the dry ingredients won't be completely incorporated and that's fine. Finish folding in the dry ingredients by hand with a rubber spatula. I baked the brownies in a buttered glass 8x8 pan instead of using the foil method. Storing: Wrapped well, these can be kept at room temperature for up to 3 days or frozen for up to 2 months. Holy Smokes! These look great! I love the raspberry sauce - so pretty! It's always a good sign when you can't restrain yourself from making a second batch! That sauce looks divine! Great job! Beautiful pictures. Your brownies look yummy! 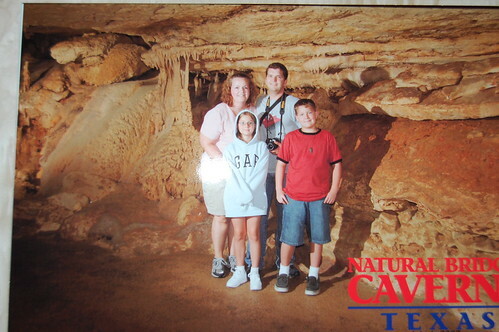 That is a dangerous picture for Tuesday afternoon at work. Looks amazing. That brownie looks wonderful! I love it with ice cream. Awesome! Love the raspberry sauce idea! Yum raspberry sauce!! Great job! I made two batches too! I'm so jealous! My brownie was cakey and I keep seeing all of these delicious gooey fudgy brownies! Your brownies look delicious! Great job! I'm so envying the raspberry sauce. Why didn't I think of that? Job well done, they look great! There is nothing wrong with a little late night baking! I bet that raspberry sauce was heavenly! Great job! 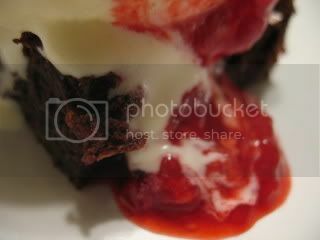 The raspberry sauce takes these brownies up a notch! Great job. I love the ice cream & raspberry sauce. 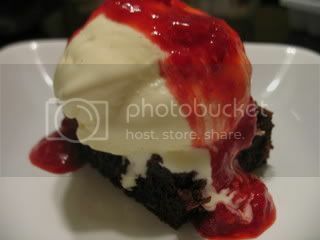 I also made a raspberry sauce my brownies and it was so good! I love the way you think my friend; alone time is something I cherish as well... and there's *never* a wrong time to bake or to enjoy a good meal. I'm glad you found your go-to brownie recipe.